Spring Hollow has always been haunted … tonight the ghosts step out of the shadows! On the night before Brenna Guin’s annual July 4th Sleepover Extravaganza, she discovers her house is haunted by the ghost of Harvey Westmore, a magician. Which, she decides, is perfect. A touch of ghostly magic is exactly the surprise her party needs. After the traditional 4th of July fireworks, as midnight strikes, Brenna launches her Midnight Surprise with Harvey’s help–and everything goes wrong. First, one of her sleepover guests becomes a living ghost. Then every ghost in the Spring Hollow Cemetery, the friendly and the unfriendly, comes to her party. And, to make matters worse, a desperate spirit takes over Brenna’s house to continue his quest for eternal life. 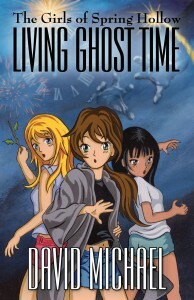 Now Brenna, with the help of her friends Lupe and Faye, must protect her sleepover guests from restless spirits while she races against the clock to rescue a ghost held prisoner–and keep her house from being destroyed–all before sunrise, when her parents wake up.